- one pair of yoga pants at a time. California Yoga welcomed 19 new customers and received $1900 in sales in 72 hours. Target fans on Facebook in order to expand their client base and as a result, increase sales. Create a customized deals campaign on Facebook valid only for new students. An app that gives me complete control over what type of deal I run and when? Sweet! I got my money quick and it weaved well into my established marketing. How Did California Yoga Company Do It? California Yoga Company is a San Francisco-based hot yoga studio. Their classes are designed to help you stay fit, while having fun. For 10 years, owner Brian Monnier and his staff have been dedicated to helping students improve their focus, health and overall life. Hot A-list celebs are doing their part to keep the yoga phenomenon alive and thriving by sharing their fitness regimens with the world. And let’s face it, yoga pants just make everything look better. With more people joining the trend everyday, newcomers may not know where they should practice. To aid in their search, the California Yoga Company’s goal was to target them on Facebook in order to expand their client base and as a result, increase sales. 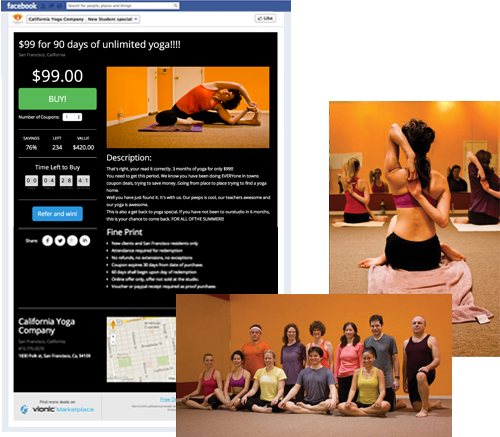 California Yoga Company created a deal using Vionic Deal Maker. The campaign offered 90 days of unlimited yoga classes for $99 – valid only for new students. It ran for 72 hours and was promoted strictly on Facebook with a $0 advertising budget. Deal Maker caters to businesses of all sizes from brick-and-mortars to Fortune 500s. With a total of only 906 Facebook likes, California Yoga Company has proven that social media has leveled the playing field. We’ve received more qualified leads using the Deal Maker platform than we have from any other daily deal competitor. We've also noticed a much higher retention rate and no longer suffer from the customer service issues we experienced when using Groupon or LivingSocial.